From the studio of Philip West depicting a Blackburn Skua getting airborne in typically grey North Sea weather. The editions are signed by men who fought courageously for ‘King and country’ flying in Skuas from HMS Ark Royal through much of the 1940 campaign off Norway. 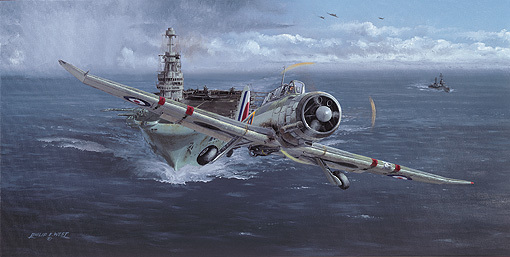 The Blackburn Skua had many remarkable "firsts" to its credit; the first all-metal monoplane built for the Fleet Air Arm (FAA); the first dive bomber in British air services; the first enemy aircraft shot down in World War Two fell to a Skua; the first fighter ace in the FAA (Lt. Bill Lucy DSO) flew Skuas and the first warship (Konigsberg) destroyed by dive bombing was sunk by Skuas.